I haven’t written much since the new year started. However, I did have a birthday, a very important birthday. At least, 30 seems important to me. It makes me feel like I haven’t done enough with my life. But for right now I want to talk about a present I received for my birthday. My mother gave me a diamond ring that has been in her family for generations. 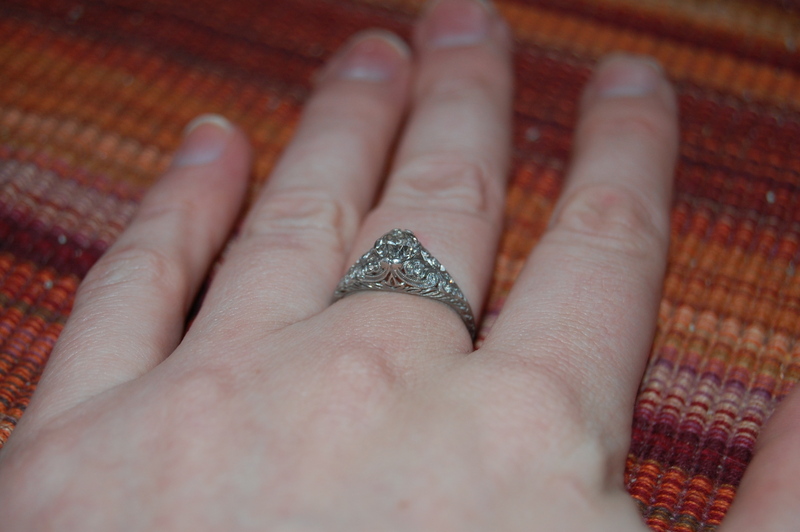 I’m not engaged and it seems unlikely that I will get engaged any time soon. I knew about the ring and that it would become mine eventually, but now it lives in my apartment or sometimes on my finger. The ring isn’t really my style – I tend to wear simple gold jewelry – but it is an heirloom. Regardless I was glad it was there because it meant I would never have to deal with buying a diamond. Most people are aware of the terrible conditions that exist where diamonds are being mined. You can buy ‘conflict-free’ diamonds, but it’s not clear to me what guarantees there are that those diamonds are truly free of all human rights abuses. As I was thinking about diamonds I remembered my sister’s experience when she got engaged and married. My mother, luckily, also had a diamond heirloom for her. But she and her husband had to find gold wedding bands (gold to match the ring). He had read this article: The Real Price of Gold in National Geographic and didn’t want to support the human rights abuses and environmental devastation that the gold industry is involved in. They looked at vintage jewelry, respected sites like Brilliant Earth, but in the end went with an artisan who dealt in recycled gold. The good thing about gold is that it is easily melted down and reused. Precious metals and gems are rare and people will therefore go to great lengths (and sometimes do terrible things) to get them and make money with them. Have you ever found that once you start thinking about something, suddenly it appears everywhere? I was listening to NPR in the car (as usual) and heard a story about a wildlife summit that is occurring in London. One of the major issues is the demand for ivory that makes poaching so profitable. I own a scrimshaw pendant and I’m happy to say that it was made on recycled ivory (probably an old piano key). Categories: Environmental Impact, Personal Stories | Tags: Brilliant Earth, diamonds, gold, gold jewelry, human rights abuses, ivory, national geographic, wildlife summit | Permalink.